An assassin accepts a dangerous mission to kill a political leader in seventh-century China. Jana Monji (RogerEbert.com): “The Assassin” is actually about one particularly famous assassin, and the original title is “Assassin Nie Yinniang.” Nie is not a common Chinese surname, but it is one listed in the “Hundred Family Surnames” ( 百家姓); it means whispers, and is represented as the symbol for three ears. Yinniang literally means “secret daughter,” and Nie Yinniang is the character of a famous Tang Dynasty short story that has since been told and retold and exists in many variations. 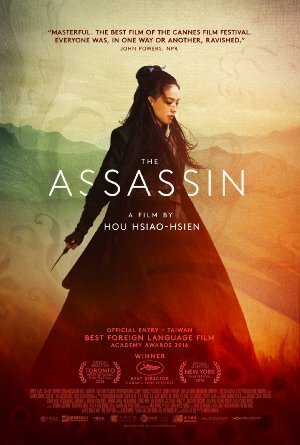 Roderick Heath (Ferdy on Films): The Assassin is an elusive and taciturn work that doesn’t entirely dispense with the expectations of its chosen mode of storytelling, but does push the viewer to adopt a different sense of them. Hou prizes mystery, with a purpose: he evokes a world where treachery and violence are so endemic that almost anyone could be guilty of something, but where the responses to such a condition must inevitably be complicated. The core theme of The Assassin isn’t political so much as personal and moral, but there’s also a definite sense of parochial political inference to the film as well: although set in mainland China sometime in the 8th century, the situation of the state of Weibo, where the tale unfolds, resembles that of modern Taiwan. Jake Cole (Slant): Simplicity begets complexity, in other words, and this can be most clearly seen when Yinniang confronts Ji'an and his wife (Zhou Yun) as they sit in their chamber. The camera is positioned to gaze through two separate curtains, one hanging over a bed and the other covering a door, and the opaque, constantly moving fabric obscures the assassin's entrance so that she appears to materialize slowly from thin air. Interview with Hou Hsiao-hsien at the Senses of Cinema: "I always tend to use long shots since I prefer to show what is happening behind the characters, meaning the objects behind the actors, the landscapes. When you use a long shot, you can better capture reality. I am in favour of realism in movies and am against the theatricalisation of action. I hate explanation in films, especially anything related to psychology, preferring instead that the movie help audiences to bring their own imaginations into the story." Interview with Hou Hsiao-hsien at the Filmmaker Magazine.